I hope these blog hops are helping you out. I will be having a giveaway soon, so watch out for that! Follow Circular Insanity via GFC . 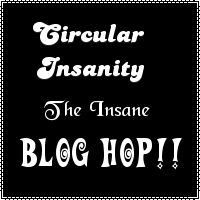 Follow Circular Insanity on Facebook and/or Twitter.Since, Blog Hops are all about getting your blog kick started, leave me a comment regarding where you have followed and I will return the favour. Even if you had your kick start, I will still return the favour. Talk about this blog hop on twitter, blog, facebook, etc because the aim of this blog hop is to get as many people as possible so you can increase your fan following. You can post about this or share the links as many times as you like.